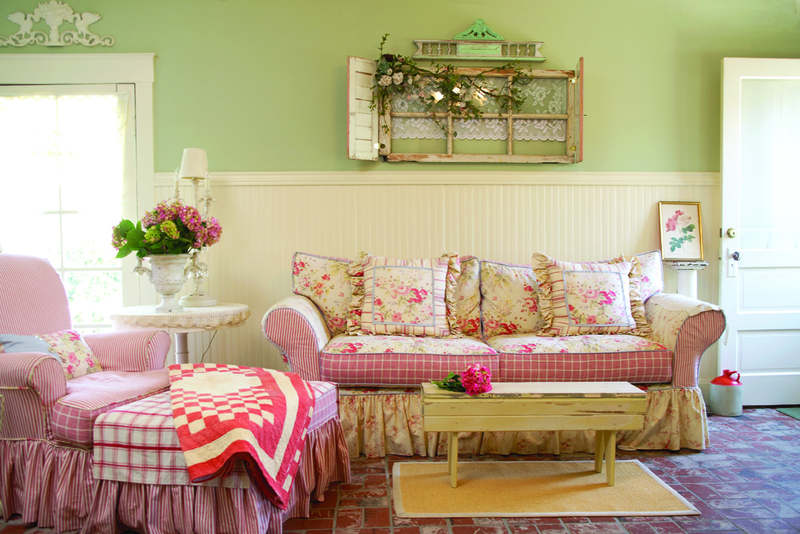 Sometimes finding a wonderful vintage window isn’t the problem—envisioning it in a new way is. Try adding some personal touches to an empty window frame, to create a unique piece of wall art. In this casual country living room, a glass-free window provides a focal point and a touch of personality on an otherwise plain wall. The lace behind the frame adds an interesting touch, while the vintage pediment above echoes the room’s colors. –Use a window frame as a door on a vintage crate or cabinet (attach with hinges). Hang a piece of lace behind it if you want to hide the contents of the cabinet. –Attach vintage hooks or knobs to the wooden frame and then hang it on a wall. Use the hooks and knobs to hang purses, backpacks, keys, etc. –Attach a window frame to a flower box or window box. Not only is it charming, but it gives a place for climbing plants to grow. –Transform the frame into a chalkboard or catch-all caddy for your kitchen. Artist and entrepreneur Christie Repasy suggests having a piece of pressboard cut to fit the spaces in your frame where the glass once was. Then, “paint it with Rust-Oleum-brandchalkboard paint and use a staple gun and hot glue to secure it. Embellish the blackboard with a hand-painted rose spray using Liquitex-brand tube acrylic paint and add a couple of hooks to the frame.” One hook can hold a basket for keeping the chalk and eraser caddy. Other vintage hardware pieces like cabinet knobs and doorknobs can hold keys, baskets, dog leashes, etc. Have you envisioned a window frame in a new way? Share your ideas or stories with us in the comments below. This entry was posted in Repurpose It and tagged architectural salvage, DIY, flea market, Flea Market DÃ©cor, Refurbish, repurpose, vintage, wall art, window frame by Flea Market Decor. Bookmark the permalink.